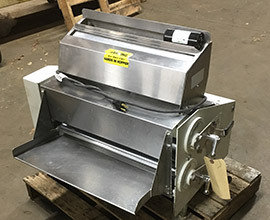 At some point in the lifespan of your manufacturing, industrial or retail business, a broken or malfunctioning commercial electric motor will cost you time and money. When commercial electric motors stop working, there is always a cost. To reduce your chances of losing valuable time, productivity and money, let the commercial electric motor repair technicians at Fixall Electric Motor Service return your business to full efficiency. Since 1967, the electric motor repair specialists at Fixall Electric have combined knowledge, expertise and customer service to skillfully repair a long list of commercial and industrial motors for thousands of Grand Rapids area businesses. From generators and electric hoists to servomotors and phase converters, sump and irrigation pumps — Fixall will get your motors running. We also expertly handle motor rewinding, light machining and fabrication services upon request. Fixall’s experienced technicians can also help you determine whether a repair or replacement will be the most cost effective option, because often replacing an old unit with a quality new one can be more budget-friendly in the long run because of the energy and productivity savings. For more information about commercial electric motor repair from the experts at Fixall Electric Motor Service, please contact us here or call the shop at 616.454.6863.